There are so many sushi restaurants in SoCal, but there is one that stands out the most. That restaurant is Sushi Delight or in Japanese, Sushi No Yorokobi. 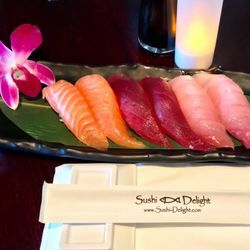 Sushi Delight is located at 2117 Pacific Coast HWY, Lomita, CA 90717. Sushi Delight opened in 2005 in Lomita, CA. I am sure that most of you have been to Orange Sushi in Torrance, or Senfuku here in Downtown San Pedro, and so much more. But, have you ever been to Sushi Delight? 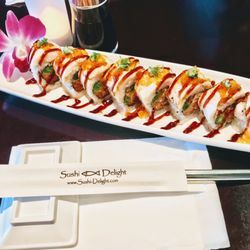 Sushi Delight is the most creative Sushi restaurant that I have ever been at and is the home of so many delicious dishes. Let’s get into it. Here are some of my favorite things to get at Sushi Delight. My favorite appetizer to get at Sushi Delight is the edamame. Edamame is a young soybean that comes from Eastern Asia. I love the way that Sushi Delight cooks them though, they steam the edamame so it is crunchy, but still soft on the inside. Then, they sprinkle kosher salt on the outside to give it some flavor and spice. Biting down on it, you get that tender, warm peas inside while the salt adds some spice into the mix. The entree that my family and I love to share is the yellowtail, tuna, and salmon sushi trio. People think that the sushi is the rolls that you get at a sushi restaurant. But, sushi is actually the fish that you like on top and rice at the bottom. I love getting the fish trio because when you put the teriyaki sauce on the fish it gives it a salty, tangy, sweet flavor all at once. Then, the fish gives it a natural freshness. Put that all together and you have a perfect entree. If I don’t get the Sushi trio I get the Cali Tempura Roll. The Cali Tempura Roll is filled with crab, cucumber, and avocado. Topped off with eel sauce and dynamite sauce. This roll is slightly fried, but not oily at all. When you bite it the crab, cucumber, and avocado it tastes really fresh, the kind of fresh that when you bite into something refreshing and you picture a tropical place in your mind. That is what you feel when you bite into this amazing roll. The eel sauce and the dynamite sauce gives it a sweet flavor to counteract the freshness that is included in the filling. It is so good. The dessert is great no matter what you get, but this one night, my family was at Sushi Delight and the owner brought out this dessert that was so good. I don’t know the exact name, but all I know is that it was really good. 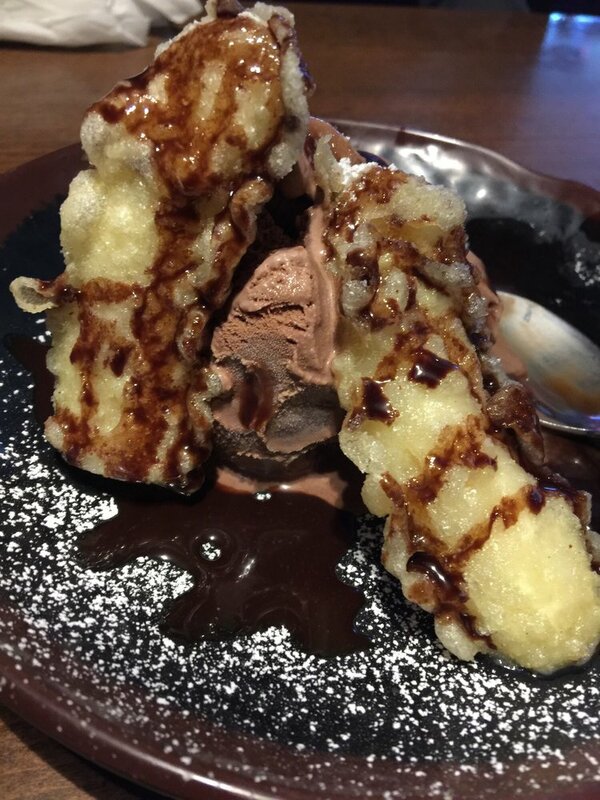 The dessert had fried bananas, smooth, silky, rich, vanilla ice cream, and on top, it had smooth dark chocolate drizzle. When you bite into it the bananas melt in your mouth, while the vanilla ice cream is smooth and creamy, and the chocolate sauce gives the dessert a dark depth to it. In the end, I would recommend this restaurant to any person who loves sushi because they have really great service, the food is so great….obviously. Sushi Delight is a great place to eat at, but with all of the restaurants that are going out of business, let’s hope this one will not.